Biomedical imaging and its numerous modalities such as optical coherence tomography (OCT), multiphoton imaging, confocal microscopy, and light sheet microscopy have been greatly enhanced by optical beam steering technologies. A breakthrough in compactness was announced in 2005 by McCormick et al when MEMS dual-axis beam-steering MEMS mirrors were used to achieve a scanning 3-D OCT probe that was small enough to fit into a standard endoscope channel . That early achievement in miniaturization and cost-reduction and subsequent technology updates by research teams have provided the medical industry with a path to low-cost, and even disposable OCT probes. There has been continued and significant focus on realization of this technology in many forms, mainly in the development of hand-held OCT probes – both in academia  and in commercial products such as Santec’s IVS-300 and ARGOS as well as Thorlabs’ OCTH-1300. From left to right: Santec’s IVS-300 portable OCT system, Santec’s ARGOS Advanced Optical Biometer, and ThorLab’s OCTH-1300 handheld scanner alongside sample OCT images it generates. All of these systems rely on microelectromechanical system (MEMS) mirrors. In recent decades, developments in OCT and confocal microscopy have continuously reiterated the need for optical beam steering technologies in the biomedical imaging industry. Namely, the biomedical imaging community continued to develop and find innovative methods and tools to utilize optics (microscopy) to image ever-smaller and more isolated portions of tissue. One such method is to use a low-coherence laser beam at an infrared wavelength which can penetrate biological tissue and alongside a special interferometric sensor which only senses light returned from a specific depth within the tissue. This is the OCT methodology of resolving very narrow X-Y-Z voxel (volumetric pixel) in the tissue. Confocal microscopy takes advantage of the possibility to discriminate out-of-focus light with spatial pinholes, providing highly resolved 3D images without background light. Finally, there are approaches that rely on nonlinear excitation of fluorescent markers in tissue such as multiphoton imaging which relies on the ability to excite specific locations within a three-dimensional sample. Regardless of how the various imaging methodologies achieve resolution, this ability to isolate a tiny 3D voxel necessitates a system that is able to scan this sensor over the tissue sample and obtain 3D information of wider regions or volumes. Examples range from 3D imaging of cell organelles, to imaging of entire cells, or regions of tissues, etc. Thus, researchers are naturally focused on the requirement to move their imaged voxel within the tissue, as arbitrarily as possible. Subsequently, designers of these imaging systems turned to scanning mirrors (traditionally galvanometer scanners and now MEMS mirrors), to scan the first two axes in the lateral dimension, which are often referred to as the B-scan and C-scan in the OCT application. 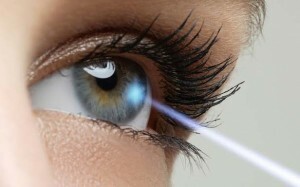 Meanwhile, movement in the third axis can be achieved via a programmable refractive or reflective lens element. ThorLabs Scanning Galvo Mirror system (left) and a Mirrorcle MEMS mirror A8L2.2 5mm MEMS mirror and its accompanying OCCIE Controller (right). The significant decreases in size, power consumption, heat production, and cost are what make MEMS mirrors ideal for biomedical imaging. Traditional laser scanning imaging and microscopy systems rely on the inconveniently bulky and high-power consuming galvanometer scanners for their beam scanning component. But as the industry demands smaller and lower-power solutions, researchers and manufacturers are looking towards alternative technologies. 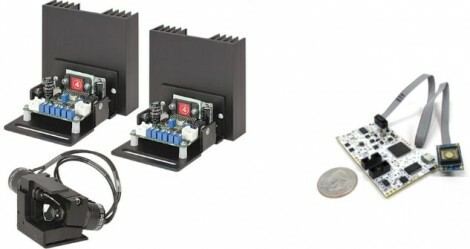 Microelectromechanical system (MEMS) mirrors are able to meet the industry’s demands by providing a compact, low-cost, and low-power consumption solution for high-speed beam steering. However, not all MEMS mirrors are created the same and many are not well-suited for this industry. The primary delimiting feature in modern MEMS mirrors is their mode of driving: resonant vs. quasi-static. A resonant drive mode is undesirable in biomedical imaging as it forfeits any fine control of the beam’s location. Quasi-static, on the other hand, provides complete programmable control of the beam, allowing for re-configurable scan areas and rates. In quasi-static capable MEMS mirrors, electrostatic MEMS mirrors are the only type of MEMS mirrors able to offer the significant aperture size and angle specifications required by imaging systems. Mirrorcle Technologies is the leading provider of electrostatically-driven, gimbal-less, dual-axis MEMS mirrors. Based out of Richmond, CA, Mirrorcle’s MEMS mirrors have become integral components in the OCT scanners of the three major commercial OCT providers and their systems: Santec, Wasatch Photonics, and ThorLabs. In order to provide physicians, biologists, and researchers with a compact OCT imaging tool, these companies rely on Mirrorcle MEMS mirrors for compact, low-power, and low-cost beam steering. In 2018, another Duke University team found MEMS mirrors to be the ideal laser beam-steering component in their “low-cost, portable OCT system”. The team, initially unable to miniaturize their OCT system by using a liquid lens configuration, turned to MEMS mirrors for their scanning approach. “The MEMS mirror has a larger aperture compare to the liquid lens, resulting in a smaller spot size. In addition, the overall scanning speed was increased by assigning the scanning and dynamic focusing control to two independent optical elements. With this approach, the acquisition speed of the sensor becomes the limiting step in acquisition speed” . Consequently, the researchers were able to present a portable, low-cost OCT system with comparable imaging performance to many commercially available systems. 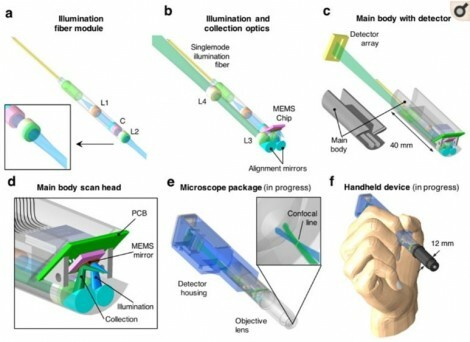 An overview of the components in the miniature MEMS-based line-scanned dual-axis confocal microscope from Yin, et al. The team chose Mirrorcle MEMS mirrors for the beam scanning component of their design. On 2 Feb. 2019, a presentation at the MOEMS and Miniaturized Systems XVIII conference in San Francisco, by Richter et al from Carl Zeiss in Jena, Germany presented a new confocal microscopy systems approach . To address the limitations of modern systems, Dr. Richter’s team took a customer-centric approach to the table-top confocal microscopy system design to specifically suit the typical researcher. In their “integrated confocal imaging system” the team took into consideration needs for simplification, size, and cost reduction while adding optical solutions to bring their imaging vision into reality. This realized vision entails imaging a fully arbitrarily programmable 3D path within biological tissues based on quasi-static MEMS mirrors providing fast dual-axis beam steering while a deformable membrane focusing mirror provides third axis and programmable pinhole allows tradeoffs of light efficiency vs. resolution, etc. Since its founding, Mirrorcle Technologies has continued to invest in R&D, allowing it to continue to offer the world’s fastest point-to-point (quasi-static) two-axis beam-steering mirrors. Mirrorcle’s researchers passionately believe in the potential for new, innovative solutions in biomedical imaging system, and the company subsequently continues to remain involved in the industry by innovating higher performance mirrors and reducing costs. Recent R&D efforts from Mirrorcle have yielded MEMS mirrors with larger sizes and faster speeds. To get these latest breakthroughs into the hands of biomedical imaging researchers and manufacturers, Mirrorcle Technologies has announced its “LiDAR/Imaging Dev Kit” which has been made immediately available. Zhao, Yang et al. “Dual-axis optical coherence tomography for deep tissue imaging” Optics letters vol. 42,12 (2017): 2302-2305. Richter, S et al. “Integrated confocal imaging system” SPIE OPTO Conference, San Francisco, CA, 2 Feb. 2019.